Dye Testing is one of the simplest and perhaps most effective ways of locating leaks. Dye can be dispensed in various areas around the swimming pool. If dye is pulled or drawn into a structural crack, it is most certainly leaking. Dye can also be used to find leaks around fittings, lights and PVC pipes. Hydrophones are underwater microphones. Austin Leak Detection uses the latest hydrophone technology to locate swimming pool leaks. When the hydrophone is placed near a leak it can pick up the sound of the leak. Pipe Cameras are also used to locate leaks in plumbing lines of swimming pools. Austin Leak Detection uses the most advanced pipe camera in the industry. Our cameras have the ability to go in pipes as small as 3/4”. Once our camera is in the pipe we also have the ability to locate the head of the camera with pinpoint accuracy using the transmitter located in the head of the camera. 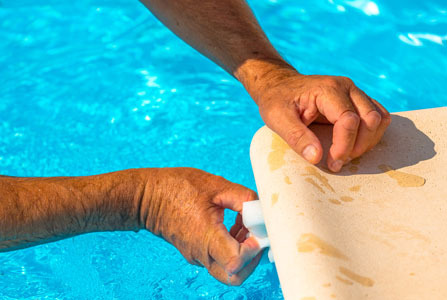 Pressure Testing is the most effective way to find leaks in swimming pool plumbing. Austin Leak Detection uses air, water and nitrogen to pressurize the plumbing lines of the pool. If a line does not hold pressure we know it is leaking. Electronic Listening Devices are used to listen for the “gurgling” or “bubbling” sound a crack in a PVC pipe will make when it is under pressure. Austin Leak Detection uses a variety of devices to hear and locate the leak underground or under the pool deck. Helium can also be used to locate leaks in swimming pool plumbing. If a leak cannot be heard, helium can be put into the line. A helium or gas detector can then be used to “sniff” out the helium escaping from the crack in the pipe.